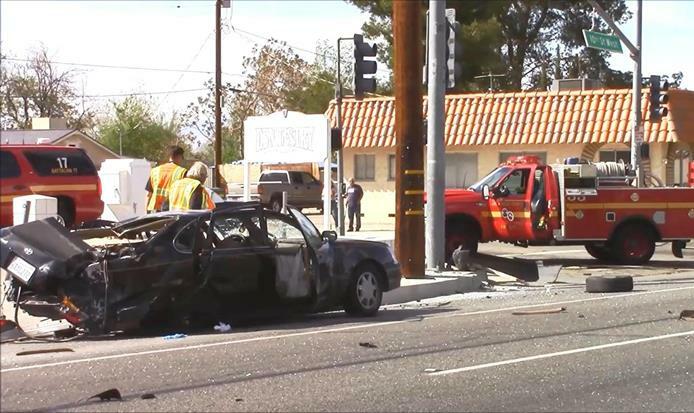 A pregnant woman is in serious condition after being ejected during a collision with a Los Angeles County fire truck. The crash happened around 2 p.m. in Lancaster, according to the Antelope Valley Times. The small, squad-type vehicle was responding to a medical call with its lights and sirens activated. The driver of the fire truck stopped on the red light and was proceeding through traffic when the crash happened. “The Toyota Avalon changed lanes from the No. 2 to the No. 3 lane to pass the stopped vehicles and collided into the emergency vehicle in the intersection,” Detective Michael Politano of the Lancaster Sheriff’s Station told the newspaper. The car crashed into a phone pole and the pregnant woman, who was in the back of the car, was ejected. “According to witnesses, it looked like the car was going rather fast, but the witnesses were all stopped for the emergency vehicle and this other car did not,” Sgt. David Jennings of the Lancaster Sheriff’s Station said. The driver and passenger of the Toyota, along with the firefighter, were transported to the hospital for their injuries.